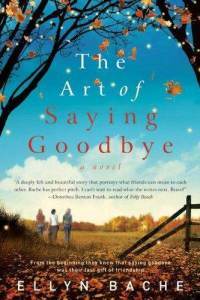 Ellyn Bache wrote The Art of Saying Goodbye because she was inspired by events that happened in her own life; a neighbor that she didn’t know too intimately, but who made a positive impact on the neighbors’ lives, grew sick and eventually died. The fictional character, Paisley, is the 46-year-old friend and neighbor in The Art of Saying Goodbye who finds out that she is dying of pancreatic cancer. It pains me to say that I feel really deceived by the description on the back of the book, which describes the women from Brightwood Trace as “close”, and their “leader” as Paisley. My take on Julianne, Andrea, Ginger, and Iona is that they each have a friendship with Paisley, who sometimes brings them all together, but not at all with each other. I also found it very difficult to keep track of each of these women were, husbands, children, and lifestyles. There is a bit of an age difference between myself and these women, but I felt that I should have been able to relate to at least one of them. However, I didn’t, and I found it a chore to make it through to the end of The Art of Saying Goodbye. I believe that Bache’s intention with The Art of Saying Goodbye was to demonstrate how perspectives can change when those we care about pass away. To me, it didn’t seem that anything in these women’s lives significantly changed. They attended the funeral, and fulfilled Paisley’s request, but after that life just went on. The structure of The Art of Saying Goodbye was also a little bit odd to me. I don’t care at all for present tense, which is how much of the book is written. There are then interspersed chapters narrated from Paisley’s point of view, which were actually my favorite sections of the book. I think if each of the various women had chapters told in the first person, I might have liked the book more. The Art of Saying Goodbye could really have been a good book, but the characters were not likable (including Paisley in certain situations), the writing wasn’t very engaging, and I didn’t feel any of the kind of emotions the author was probably hoping for from readers. This one just wasn’t a good fit for me, and I don’t think I’ll be interested in reading anything else by this author. Sounds like a good book..great review! !